Perfectly Created Chaos! : So True, So True. You may be wondering about the strange title for today's post. It refers to the sentiment on the card for today. It is from the Fifth Ave Floral set that I finally got. I've been wanting it for the longest time and was so happy to get it. I love the sentiment because I think that it is probably one of the most true things I've ever read. They are definitely words to live by, aren't they? This card also uses some of the new in colors for this year. I think the same thing every year when they come out with new colors. I am sad to see the old "new" colors go; but am delighted with the new ones. Honestly, I don't think that I've been unhappy with any of the colors SU has developed since starting the in colors. What's amazing is how many things I see in fashion, and home decor and other things that have colors so similar to these new colors. Any one else experience that? So, here I've combined Razzling Razzleberry, Crushed Curry, Melon Mambo and Pumpkin Pie. I used a blender pen with the ink pad to color the flower. It came out a bit bright in the picture. It looks more like pink passion than melon mambo! The rest is very straight forward, so I won't bore you with the rest of the details. Have a great day! Leave a comment for me...I love to hear from you! Also, I hope you like the new blog look. I figured it was time to change it up a bit! Love how you used the new in colors with the Fifth Avenue Floral set. It really gives this set a fresh look! Wonderful card. This set is still on my wish list!! Luckily for me, my sister has it and I get to play with it when she visits! 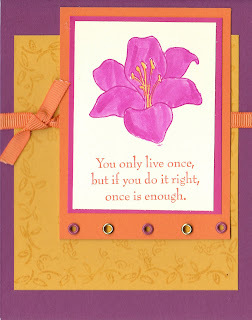 Love the bright vibrant colors of this card and your gorgeous lily! The row of eyelets brings the focus to the sensational sentiment! Beautiful bright card. I SO hope this set will be in the next UK catty! love the bright colours on your card, great image too!! Cute colors, and I LOVE the sentiment!